Over the years, Kerry Washington covers have ranged from stunning (InStyle, Allure or The Edit) to a complete mess (ELLE and Glamour — not Mrs. Washington’s fault, of course). Kerry’s latest gig, for US Marie Claire‘s November issue, replaces an outrageously Photoshopped Nicole Kidman cover on the newsstands. Photographing like a dream for Thomas Whiteside, the American actress is radiant on the newsstand cover (below) working a Versace number like there’s no tomorrow, styled by Solange Franklin Reed. Members of our forums were impressed. 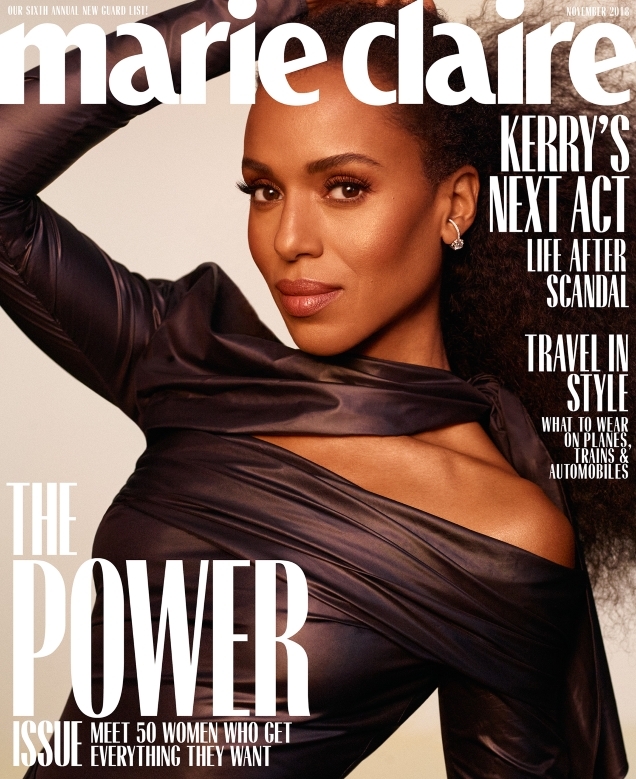 “Ooh, easily Kerry Washington’s best cover and editorial to date. It looks vintage and yet very now, and I appreciate that they didn’t blur or lighten her skin like other magazines have done in the past. This is an exquisite direction for Kerry hair and makeup wise, I hope it continues in this vein,” stated dodencebt. “Wow, a winner for her, finally! I like this. It is her best yet, followed closely by her InStyle cover which, incidentally, was also shot by Thomas Whiteside. She looks fierce and in control,” raved Benn98. “Fantastic! Someone finally did justice to her beauty,” Lola701 rejoiced. “Finally, the fierce cover she deserved. She looks amazing!” said KissMiss. “Fantastic cover! The layout and fonts work really well with the image,” wrote kokobombon. “Wonderful cover! I’d put her in front of the logo or move the text down from her hair, but nevertheless, it’s so modern, fresh, striking,” said forum member Srdjan. Are you into it just as much as we are? See Kerry’s accompanying cover shoot and share your thoughts here.